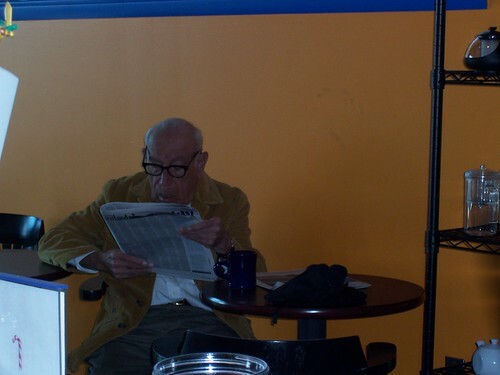 Tony is an old gentleman who comes to the caffe everyday and has our Press Pot Coffee or a traditional espresso drink. He never asks for our “Press Pot,” but he’d ask for “the Costa Rican today, please,” or “the organic Guatemalen Coban today, please,” as far as this week goes. When he comes we talk about Europe, war, history, and our dogs, and then he’d read the paper and have his coffee. Tony is cool, and as our friend Brian said, “He’s like a character in an animation or manga.” Truly.